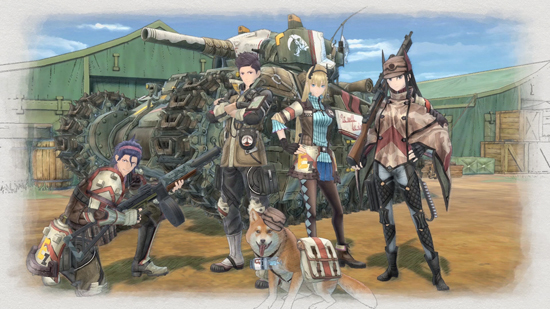 Get to know your squad (and their respective classes and motivations) in the new Valkyria Chronicles 4 Squad Trailer, featuring the ever-determined leader Claude Wallace, brilliant inventor Riley Miller, and brave rescue dog Ragnarok. Join the Ranger Corps' Squad E in Valkyria Chronicles 4, where intense battles, bitter snowstorms, and tales of sacrifice await you on the East Europan Imperial Alliance borders this fall. Take the fight to the Empire with the Valkyria Chronicles 4 "Memoirs from Battle" premium edition, and dive into two new adventures with your favourite Squad 7 characters from the original Valkyria Chronicles. This special edition release (MSRP - $99.99) comes equipped with an exclusive art book themed as Claude's travel journal from the game and a replica of his mighty tank, the Hafen. Arm yourself for the battle ahead by pre-ordering the "Memoirs from Battle" premium edition today. Exclusive Vinyl Statue of the "Hafen" Tank - Triumphantly bursting onto the scene, the "Hafen" tank vinyl statue is ready to conquer the snowy battlegrounds of Europa. More than just a tank, the "Hafen", named after Claude's hometown in Gallia, is a meaningful symbol for all of Squad E's members. This version may not have the firepower of the original, but it makes a great center piece for any fan's collection! "Claude's Travel Journal" Exclusive 100-Page Themed Artbook - Valkyria Chronicles 4's story is told through the photos, notes, and memories captured in Claude's travel journal. This exclusive art book, inspired by Claude's journal in-game, features a wide selection of the beautiful watercolour-styled art from Valkyria Chronicles 4. Valkyria Chronicles 4 will be available on PlayStation 4, Nintendo Switch, and Xbox One platforms in the Americas and Europe in Fall 2018. The game has been rated T for Teen by the ESRB for PS4 and Xbox One. Rating Pending for Nintendo Switch.